Atlanta Beltline Westside Trail — Eutree Inc. The Atlanta BeltLine's Westside Trail is nestled in a heavily forested swath of the city. While the removal of some trees was required to make way for the 3-mile multi-use trail and future transit, Atlanta BeltLine strove to minimize the impact to the tree canopy. Hundreds of large trees will be replanted along the Westside Trail as part of the Atlanta BeltLine Arboretum by Trees Atlanta. At the time, many trees were salvaged for future, as-yet-to-be-determined projects. ABI partnered with Lifecycle Building Ccenter and Eutree to recover, store, and preserve the trees. Once the logs from the trees arrive at Eutree's mill, they are tagged with blue paint to keep track of which ones came from the Westside Trail. The logs are then milled and cut into cants. The cants are stacked on the loading dock to go into the warehouse. The cants are moved by forklift and placed onto the resaw to be cut into boards. The cants are then cut into boards. The boards are carefully stacked on spacers for proper drying. More stenciling is applied to identify the boards slated for Westside Trail. Stack of completed boards air drying outside Eutree's warehouse. 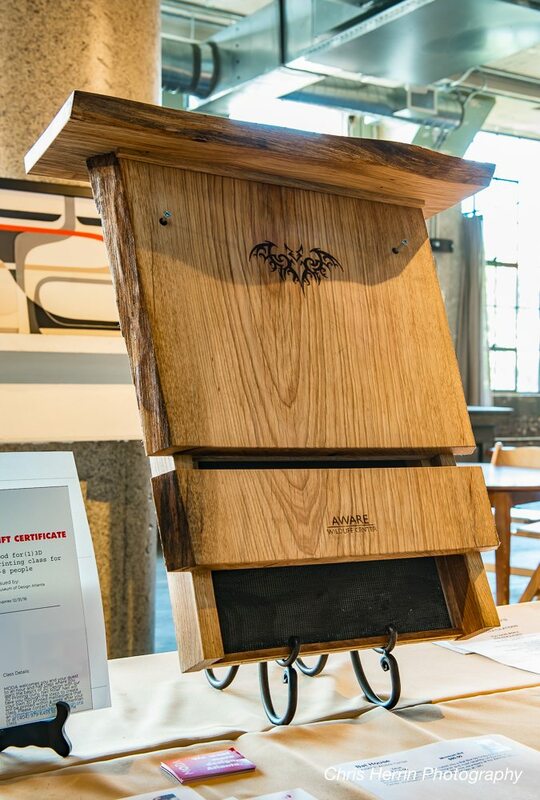 Craig Stehle, a local educator, journeyman, and industrial designer, took some of the maple boards and fabricated this custom bat box. Bats play a key role in pollinating plants and are natural pesticides against mosquitoes. Photo credit: Chris Herrin Photography. Phil Proctor, a sculptor and Art on the Atlanta BeltLine artist, fabricated this table from one of the poplar slabs. Photo credit: Chris Herrin Photography. Architect Robert M. Cain created this table from one of the ambrosia maple slabs. Photo credit: Chris Herrin Photography. 678.313.4110 | hello@eutree.com | Villa Rica, GA | © 2019 Eutree Inc. All rights reserved.